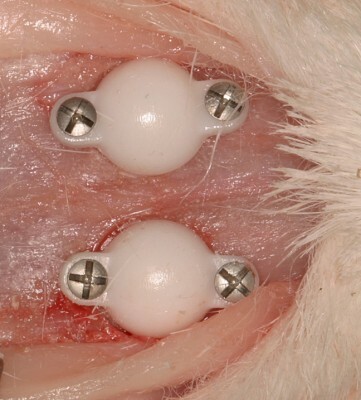 Abstract: The purpose of the study was to evaluate histologically, whether vertical bone augmentation can be achieved using a hollow ceramic space maintaining device in a rabbit calvaria model. Furthermore, the chemistry of microporous hydroxyapatite and zirconia were tested to determine which of these two ceramics are most suitable for guided bone generation. 24 hollow domes in two different ceramic materials were placed subperiosteal on rabbit skull bone. The rabbits were sacrificed after 12 weeks and the histology results were analyzed regarding bone-to-material contact and volume of newly formed bone. The results suggest that the effect of the microporous structure of hydroxyapatite seems to facilitate for the bone cells to adhere to the material and that zirconia enhance a slightly larger volume of newly formed bone. In conclusion, the results of the current study demonstrated that ceramic space maintaining devices permits new bone formation and osteoconduction within the dome.